As much as you feel the need to play “treat police” this Halloween, try not to. It’s no fun for you as the parent, and it takes the joy out of Halloween for your kids. 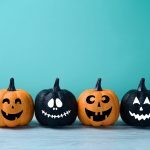 Instead, take advantage of this fun holiday by using it as a teaching tool for your kids, to learn how to manage their treat intake on their own (now and in the future), and not feel the need to sneak, hide or gorge on treats. Believe it or not, Halloween presents a fantastic opportunity to grow your child’s long-term relationship with food! 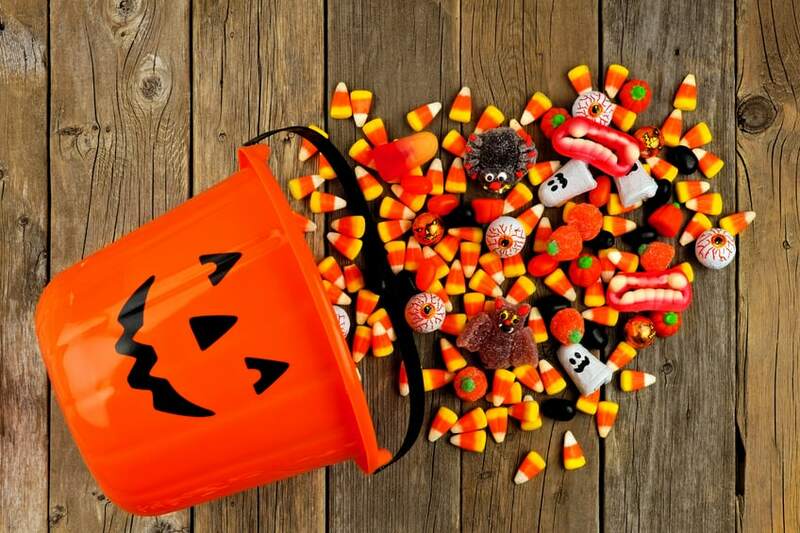 It’s much easier to manage treats before they are in your house, so make sure to wait until the day before (or day of) to buy Halloween candy, so that you don’t have to deal with the “see-food syndrome”. Also, send your kids out with smaller bags or buckets and limit the time that they are out (or the number of houses your kids visit) so that their stash is smaller to begin with. Serve a healthy and balanced dinner before heading out trick-or-treating. This way, your kids won’t be ravenous candy-monsters by the time they come home. Ok, maybe they still will be, but they’ll likely be more open to enjoying their treats in moderation instead of devouring them all in one sitting if they’ve had some nourishment prior to heading out. Make sure that each meal and snack contains some protein (such as meat, eggs, beans, lentils, dairy products etc.) and fibre (veggies, fruits, whole grains, beans/lentils etc.) which will help your kids to feel fuller longer and may tame the sugar monster later on. Check out my Top 10 Easy Weeknight Dinner recipes for some inspiration for a healthy pre trick-or-treat dinner! When your kids return, get them to sort through their candy and separate the “can’t-live-withouts”, and put the “just oks”. This is one case that you want to encourage your child to be a picky eater. Ask your child if they would like to trade their mediocre candy in for something else–perhaps a serving of their favourite homemade dessert (maybe not the same night), or maybe it’s a small toy that they’ve been eyeing for a while, or maybe an experience like a movie or going to an indoor playground. This teaches kids to be choosy with their treats and eat what they love (and enjoy it) instead of eating what’s in front of them just because it’s there. Now I know that I just said to teach your kids to be picky when it comes to treats, but you could also encourage them to try something new. Do something that your kids don’t expect and encourage them to try a new candy or chocolate treat that they’ve never had before, or that they’re unsure of. For example, if they always go for gummy-type candies, encourage them to try a mini chocolate bar with nuts in it. 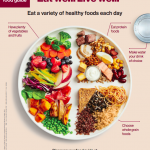 This will not only put treats on a more level playing field with other foods (which will decrease the desirability of them), but will also encourage them to be more adventurous with all foods (including healthier ones at mealtimes). Without micro-managing your child’s consumption, let her eat as much as she wants on Halloween night. You read that right–as much as she wants. 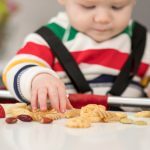 Your child might surprise you by having a few and then deciding to save the rest (like my son usually does), or gorging on them and eating until they feel sick (like my daughter might). Either way, it ultimately teaches your child how to self-regulate her intake of treats down the road. It also removes the “forbidden-fruit” factor. 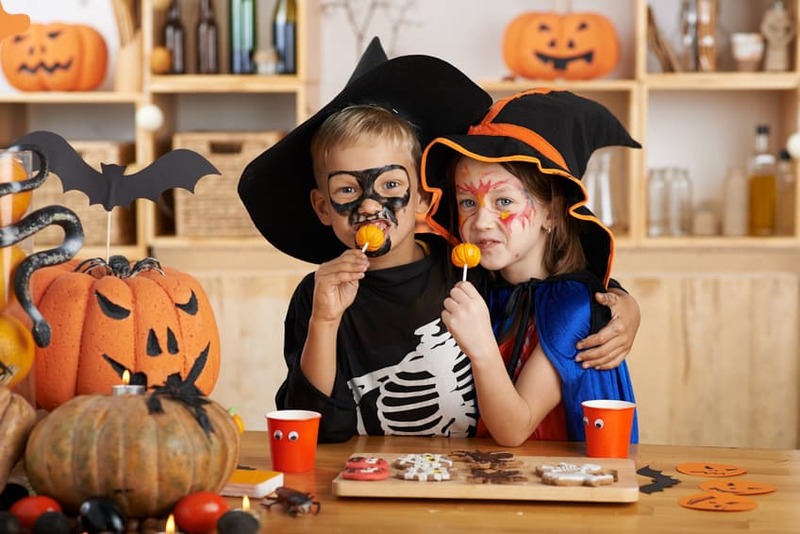 If kids have free rein to enjoy their candy (or treat foods in general) sometimes, and they know that they are able to have them (in moderation) regularly, it takes the urgency to “get it in while you can!” away. It also decreases the chances of your kids sneaking candy or over-indulging when you’re not there. And I promise you–one night of gorging on treats will not effect her long-term nutritional status or weight. If you take charge of the candy stash and police when and how much candy can be consumed, you’re sending the message that your kids cannot be trusted with it. In other words, this doesn’t teach them how to moderate their intake of treats. 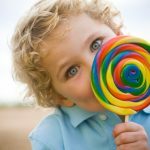 In the first two years of life, kids don’t need (and shouldn’t really eat) candy or high sugar treats at all (with the exception of birthday cake of course). From ages two to four-years-old, kids aren’t old enough to manage their candy stash on their own, so it’s best if you help them by coming up with a daily amount of candy that seems fair (maybe it’s one, two, or four depending on age) and allowing your child to decide when they are going to have it (it could be for dessert after lunch, as part of a snack in the afternoon, or even WITH a meal). 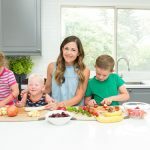 For kids ages four and up, they are likely ready to manage and store their own stash with the expectation that they will adhere to the daily amounts that were negotiated and eat their candy in a designated area (usually the kitchen table where there’s few distractions). 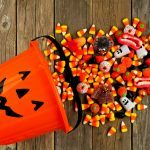 Giving kids the opportunity to manage their candy stash will take some of the power away from the candy and give them the confidence to manage their treats in a healthy way. 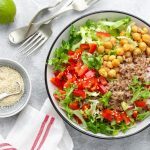 Regardless off age, I encourage parents to decide when designated eating times are (grazing all day on snacks–or candy for that matter–is a recipe for mindless eating and mealtime battles (and potential health/weight issues down the road). 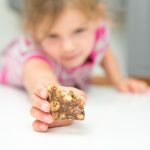 Kids learn by making mistakes, and however upsetting it is for us parents to see our kids gorge on treats (and even get sick), ultimately, this will teach our kids to moderate their intake of them. Instead of getting angry and punishing kids for eating too many candies, approach the situation calmly and get your child to talk about it. Ask her why she thinks she feels sick and what she might do next time to avoid the same feeling again. Explain how the fun is taken out when too many candies or too much chocolate is consumed. Instead of feeling embarrassed and ashamed, your child will learn from her mistake and think twice before doing it again. 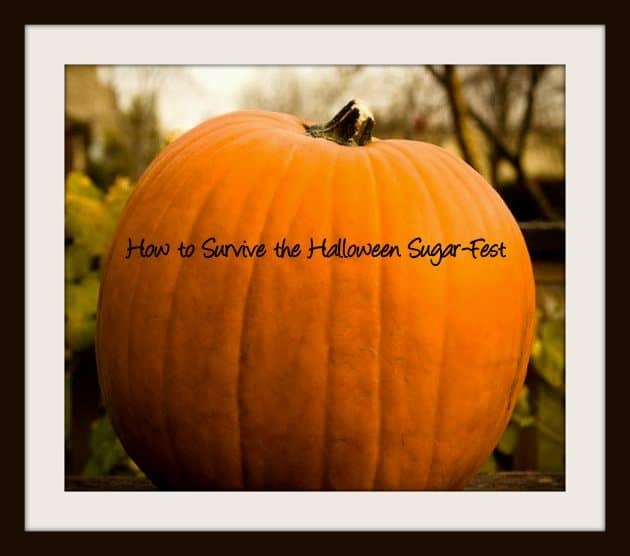 Don’t dread Halloween because of the candy overload. 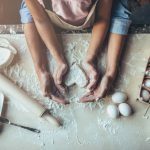 Think of it as a great opportunity to teach your kids about moderation, balance, and healthful indulging. Great strategy Sarah! I followed many of these steps with my children with both Halloween and Christmas candy and never had any problems. Great tips! Love this! 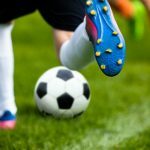 Fantastic read on what to do. It can be hard to give up that control as a parent, but teaching principles is so important! These are such great tips for the holiday Sarah! Thanks so much for sharing! These are really great tips! I love how you included let them enjoy and let them make mistakes! So true!